Game works on modern systems (see Installing on 64-bit versions of Windows). Patch 1.02 adds a better flight model and experimental 3Dfx acceleration. The patch comes in a 16-bit installer executable and so cannot be installed natively on 64-bit Windows. Config files require a hex editor to read and are not easy to interpret. 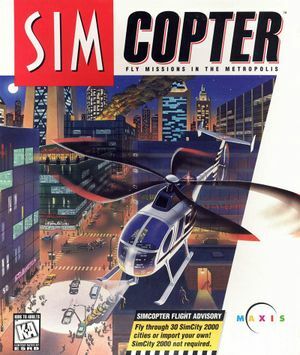 SimCopter is locked at a display mode of 640x480 256 colours. Create a shortcut with the command line option -w and enable reduced color mode (8-bit 256 color) in the compatibility settings. Using Alt+↵ Enter to change from fullscreen to windowed causes major graphical issues, but it works fine the other way round. Joystick deadzone can be set using Tweaker program on disc. Sliders for Game and Radio volume. Ability to turn off radio commercials and DJ. The original disc release uses a 16-bit installer. Copy the contents of disc somewhere temporarily. Extract the new installer into the setup folder. The game often runs too fast on modern CPUs and must be slowed down. Use a CPU slowdown utility, such as CPU Grabber. Use an external framerate limiter such as one found within FRAPS, RivaTuner, Nvidia Driver, etc. to limit the framerate to around 30 FPS. 2.1.1 Only available after installing the 1.02 patch and activated via the command line option -v. This mode is experimental and so the HUD and some other features are missing, with a number of graphical glitches also present. Supported by nGlide. This page was last edited on 2 September 2018, at 13:05.